Thread# 38389 You Accidentally Bought a Vacuum Shop... Now What? Thread# 6903 1919 Hoover plug? Thread# 38357 Why Does Dyson Credit Himself As First Bagless Inventor? Thread# 38371 Eureka Power touch cordaway help! Thread# 38192 What's the correct Kirby 560 bag? Thread# 38363 Royal 10" Floor Brush: 303 Kit Now Completed! Thread# 38340 What type of disposable bag fits Royal 611 Vacuum?? Please Help..
Thread# 38347 How do I get at the motor of this Eureka? Thread# 38342 Changing Kirby roller cap ends ? Thread# 38343 First Fantom logo ??? Thread# 38300 Finally, I got one! Thread# 38328 Kirby DS50 -- rear bearing? Thread# 9319 How many vintage Canadian Electroluxes are among us? Thread# 38306 Hoover Convertible what model? Thread# 38305 How loud should it be? Thread# 38221 Any New Hoover Model O Discoveries? Thread# 38279 Say hello to my little friend. 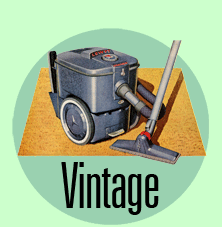 Thread# 38272 Why did later Hoover uprights not include floor brush? Thread# 38206 Could anybody tell me about my JCPenney-branded Hoover Convertible? Thread# 38254 The Montgomery Wards "Signature"
Thread# 38246 Electrolux 1521 Marquis Rare? Thread# 38245 Solid White Hoover Convertible?